Each week, we note and comment on the NFL’s biggest transactions. Here are the transactions between the end of Week 4 and the beginning of Week 5. 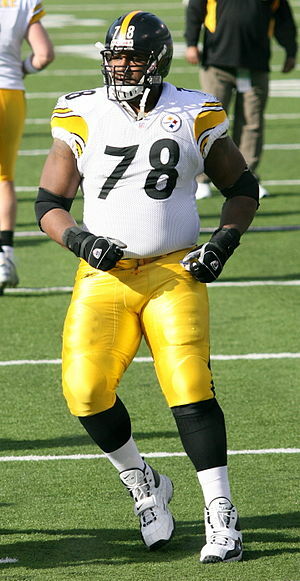 Steelers (add OT Max Starks, cut OT Chris Scott) – To address a banged-up offensive line, the Steelers brought back Starks, who was cut in the preseason for being overweight. Starks, a former starter, jumps right back into the lineup at left tackle. Dolphins (put QB Chad Henne on IR, add QB Sage Rosenfels) – Henne suffered a shoulder injury and opted for surgery, so the Dolphins held quarterback tryouts and settled on the veteran Rosenfels. Rosenfels will back up Matt Moore. Jets (put OLB Bryan Thomas on IR, promote LB Eddie Jones) – Thomas, a former first-round pick who has been a long-term contributor as a pass-rushing outside ‘backer, suffered a season-ending Achilles injury against the Ravens in Week 4. Rams (put WR Danny Amendola on IR) – Amendola, the Rams’ leading receiver last year, suffered a setback in his attempt to recover from a triceps injury and landed on IR instead. Colts (put OT Ben Ijalana and DT Eric Foster on IR, add OTs Michael Toudoze and Quinn Ojinnaka) – We covered the injuries to Foster and Ijalana in this post. Toudoze and Ojinnaka add needed depth at a banged-up offensive line position. Lions (add S Vincent Fuller) – Fuller, an ex-Titan, joins up with former Tennessee coaches Jim Schwartz and Gunther Cunningham in Detroit to add secondary depth. Panthers (cut S Sean Considine and DE George Selvie, sign S Jermale Hines and DE Antwan Applewhite) – We discussed the reasons behind this move in the mid-week Panthers report. Selvie, a waiver pickup earlier this season, lost his spot to Applewhite, who played for Panthers head coach Ron Rivera in San Diego. Eagles (put DT Antonio Dixon on IR, sign DT Derek Landri) – Dixon, part of the Eagles’ rotation up front, suffered a season-ending torn triceps injury. In his place, the Eagles brought back Landri, the ex-Panther who was in training camp with them. Giants (add CB Justin Tryon, cut CB Brian Williams) – Looking for more cornerback depth, the Giants cut the veteran Williams and replaced him with Tryon, an ex-Colt who isn’t as big but who has more speed.